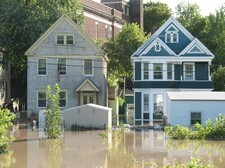 How to help the Irene flood response? I just made a donation to the American Red Cross, but was wondering if there were other ways that I can help the victims of flooding. We've collected a few ways after the jump. We're sure there are others -- so, if you know of way to help, please share it. The United Way of the Greater Capital Region is taking donations for Irene relief and organizing volunteers. The American Red Cross of Northeastern New York is always looking for volunteers, and offers classes on how to become a disaster relief volunteer. The Cuomo admin is organized volunteers over Labor Day weekend and it looks like it may do so again. It's also directing donations to the United Way. The Watershed Post has compiled a list of drop-off points for donations to help recovery efforts in the Catskills. There's a Windham Rebuild fund to assist the town. The food bank is accepting donations of bottled water and non-perishables via Sunmark Federal Credit Union and Hannaford. It's also accepting donations via text: "Make a donation to the Food Bank for Hurricane Relief. Text RFB to 20222 to make a $5 donation to the Regional Food Bank. Be sure to reply YES when you are asked to confirm. Messaging and data rates may apply." The supermarket chain is accepting donations at its registers. FarmieMarket and All Good Bakers are raising money for local farmers affected by flooding. A group of people have created Upstate America t-shirts to raise money for recovery efforts, and to show solidarity with people upstate. + A bunch of NYC-based musicians have put together a benefit album for upstate flood recovery. Matt Baumgartner has started a Jumpin' Jack's recovery fund. If you live in an area supported by volunteer fire and/or EMS services, they are always in need of donations and volunteers. Even if you can't ride the truck or treat patients, they can use your help. There are many roles to fill both active and supporting and all of these organizations are desperate for volunteers. It is one of the best ways to help out your community. These folks have been working tirelessly since before the rain started and are still making the rounds pumping out basements. Is anyone collecting non-perishables and water? I've only heard of one location collecting this stuff so far, but it's far away from me. We bought so much in the way on non-perishables because our stove is electric, but then Colonie/West Albany wasn't hit very hard and we didn't even lose power. I'd like to give it away, if people need it! Thank you guys for posting all of this information! The disaster is really unlike anything else we've seen in this region--so widespread, affecting so many different communities--that there's going to be a need for volunteers for a LONG time. Also, Nicole, I believe the Salvation Army and Catholic Charities are the lead agencies on collecting non-perishables and other material goods. @ Nicole - I'm sure the regional Food Bank of Northeastern New York would be happy to take that stuff off your hands. They are located on Albany Shaker Rd in Latham. Also, their FB page says that Sunmark FCU is collecting water and non-perishables at all of their branches. An informal way to help out is to offer any of your older neighbors a hand cleaning up the debris in their their yards. Also, maybe head over to one of the public parks and pick a small section to clean up--just picking up the trash and small branches, but keep away from any dangerous tree limbs. The Schoharie County Community Action Program on East Main St. in Cobleskill is accepting toiletries and clothing. Also, PolkaDots Consignment Store in Cobleskill and Smith's Collision on Rte 20 in Sloansville, both in Schoharie County, are accepting water, food, gently used clothing, bedding, batteries, and monetary donations. Hey guys: the Red Cross class for tomorrow is already full (40 people--hopefully lots of AOA-ers! ), so we've added another one Thursday. Same bat time, same bat place, same bat call-the-Red-Cross-to-register number. Thanks for spreading the word, AOA! If you are a ham, Greene and Rensselaer counties are asking for help in their Emergency Operations Centers and out in the community. Amateur radio emergency communication services ARES & RACES have been activated. Greene county in particular is looking for 20-25 volunteers. At the bottom of this article is information about how to volunteer and where to donate in Montgomery County. The Schoharie County Comm. Action Program will have a truck at the Colonie Police Dept. Fri Sept 2 from 7:30 am to 3:30 pm - they are accepting EVERYTHING anyone might need to clean up and get by...from sponges to diapers, clothing, medicines, toilet paper, soaps, clothing, etc.....you get the idea. More info is on www.albanykid.com. (please publicize, AOA, if you can! haven't seen this info spread around much yet other than on Facebook). The Saturday Delmar Farmers market will be taking donations for SCCAP this Sat as well. Gordon Farms, through Farmie Market are raffling off a 100 lb pumpkin to help. Several other area farmers not as hard hit have offered to donate 10% of this weekend's sales to the cause. There are many many ways to help! Try to find someone you know who knows someone affected, I bet they would welcome personal assistance from a close acquaintance. We are thinking of driving out there Monday to help w/ a friend's family. Catskill has a CAP as well, they need donations - these CAPs (from what I can tell) are the first responders, they know the families affected and who needs how much help, where/when. This is great - I will post link for Facebook friends - I think you meant September on this "Updated August 2 at 4:55 pm"
Editors: Erp. You're correct. September. Fixed. Thanks. The YMCA is holding a school supply drive, donations can be made at any YMCA in the Capital District!